Although M&S have had some negativity over the last few months about their lack of design in ladies clothes, I have to say they have completed nailed it this Autumn/Winter! Today saw the launch of none other than Holly Willoughby putting her name to twenty key pieces that she highlights as MUST HAVES from their M&S collection – now that is truly a recommendation! I’ve had this date in my diary for a few weeks, and so this morning when the alarm went off at 6.30am I thought I would take a peak. Now I knew I was going into White City today and so there was no need for me to shop online. Interestingly the three items I would have purchased… I’m not saying their bad…. but after a try-on session this afternoon, my three Must Haves changed! One I bought… another has gone to the “I need to think about more” list and the other well if I don’t find anything else on the high street that’s as good, then I will go back. I loved this instantly and it was the first item I wanted to try on. It’s absolutely gorgeous and it’s great quality, I sized down for a less floaty finish. I loved it, just not sure it loved me. It’s a fabulous price at £29.50. 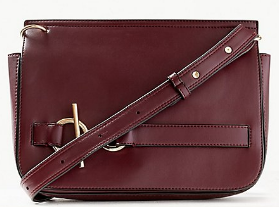 I’ve been looking for a burgundy bag for the last few weeks, and this looks perfect… until I saw the green. 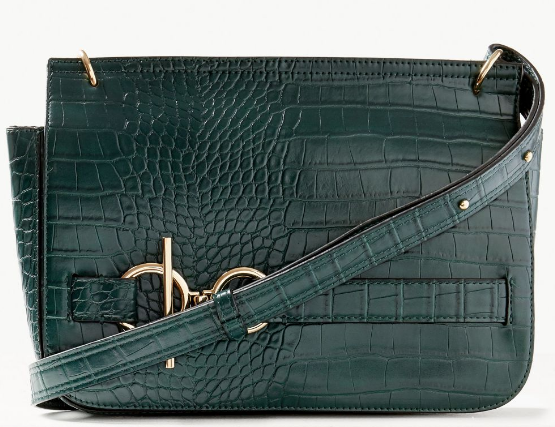 I have to say I prefer the faux croc finish, it just oozed “expensive” but a green bag I don’t need. These bags are a fantastic price at £35! This dress is lovely! If you plan to order online I recommend to size down one. I personally found it a little short on me I needed it to be a few inches longer and so sadly I didn’t buy. 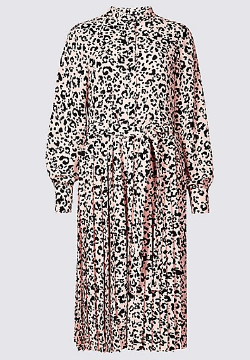 It’s absolutely great quality and I like the pink animal print it makes a lovely change. This one will sell out fast… all the small sizes have already gone online! 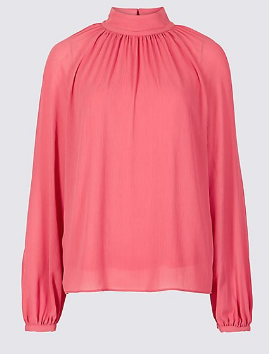 So this is the blouse that I love…but not sure if it loves me! It looked great with the check trousers that are also in the collection. There is a skirt too, but this is too short for my personal style but would just as fabulous with these tops too. I was super surprised at just how lovely this coat was on! I only took my size into the changing room but I would recommend to try the next size down it didn’t fit the shoulders perfectly. The buttons are poppers – not sure how I feel about this as I wear my coats open most of the time, but done up this was spot on. 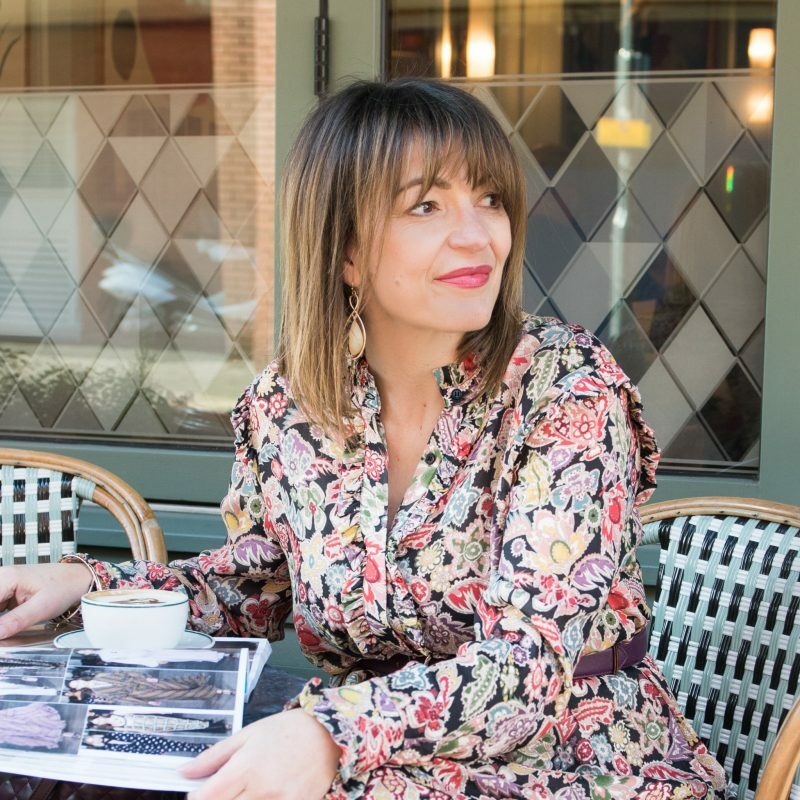 This is the blouse I bought… none of the photos in this post does it justice… you’ll have to wait for an #ootd post on Instagram when I blend this in with my working office wardrobe – I cannot wait to wear it! 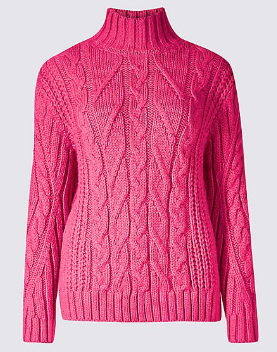 And this cable knit in bright pink is on my ‘not sure’ list – the more I look at it, I love it…. Okay for my favourite three! I highly recommend you take a look at these and if you can make them work with your existing wardrobe then, buy, buy, buy – before they sell out! The sock boot still remains to be a key player this winter, and I absolutely love these burgundy ones, they are a great colour choice this season. I can’t see these hanging around for long. 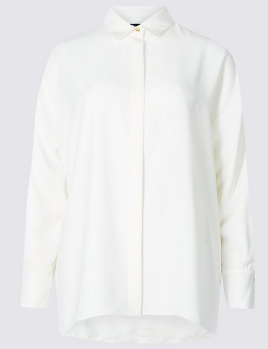 This is the one I nearly bought… I loved it but apart from my jeans which I’m not keen to wear much, I just don’t think it will go with many items in my existing wardrobe… and I’m a firm believer that new items have to work with existing. I tried on my own size which was fine, but then I did size up for an oversize vibe, and I preferred that look. So for me, size up! This was the item I bought. Never in a million years at 6.30am this morning did I think I would be buying this! I cannot tell you just how fabulous this shirt feels on. I’ve bought it for the office, but you can easily dress this up for an evening out (think tuxedo trousers or black leather pencil skirt). This shirt is unbelievably superb value for quality, feel and just how good it looks on! Although it does say in the description ‘Oversized’ I sized down one as it was too baggy around the front and back, but this could be because I am hourglass in body shape – so think about your own body shape before selecting a size. Holly has picked really well! And if you would like to see the full twenty items from this fabulous collection, simply click here. These items are not in every M&S store, so check their website to see what locations are stocking the full collection. The post HOLLY WILLOUGHBY’S MUST HAVES FROM M&S COLLECTION was on Loved By Lizzi first.